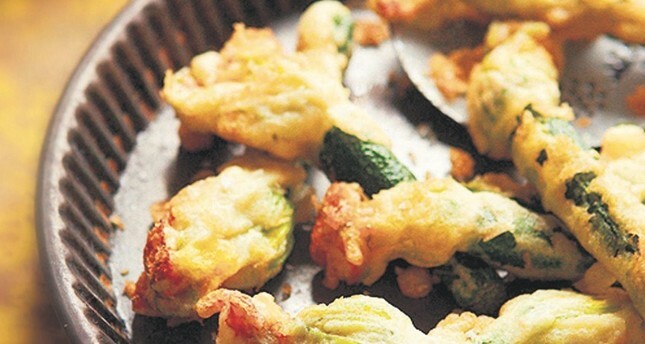 Stuffed squash blossoms is a favorite summertime dish in Turkey. Whether it be eating seasonal greens or other summer vegetables and fruits or trying some of the specialties of this season, Turkish cuisine offers a number of ways to beat the summer heat and replenish vital nutrients. You may see signs in the summer months that read "Buz gibi Karadut Suyu," referring to a refreshing black mulberry drink made from a mix of juice and ice water. Bottles of black mulberry juice are also available for purchase; however, to acquire the right consistency due to its thick and syrupy nature, the proportions used are one part juice to five parts water. A sort of all-natural version of the British "Ribena" drink as it were, but much more delicious if you ask me. During the summer season, undoubtedly one of the most popular drinks to enjoy in Turkey is lemonade. What is interesting is that despite its popularity in summer months, this beverage is pretty much nonexistent the rest of the year. So, enjoy because most of the time, the lemonades are painstakingly made from real lemons, and many establishments take pride in their particular blends. Often, it will also be served with a sprig of fresh mint, or with the newest trend, a leaf of basil. Ayran aﬂ› is a soup that can be served warm or cold, with the latter being a popular variation in the summer months. There is never a more obvious time that ayran, a drink made from watered-down and salted yogurt, is more enjoyed in Turkey. While ayran maintains its popularity throughout the year, this refreshing and savory drink becomes especially popular in summer. A great way to replenish minerals in the summer heat, ayran is available nearly everywhere and in summer, is also be seen served with basil. Ayran aşı is a soup that can be served warm or cold, with the latter being a popular variation in the summer months. Rich in grains such as wheat and chickpeas, the base of this savory soup consists of yogurt and mint. Not to be confused with cacık, which also functions as a summer soup of sorts as it is regularly ordered as a side dish and is made of yogurt, cucumbers and mint. It could easily be argued that karsambaç may have been an early ancestor of what we now know as ice slushies. With a history spanning three centuries, this beloved dessert consists of snow doused in a sweet, fruity syrup. This is a steadfast tradition by those residing in the Toros Mountains region where snow is easily collected and stored particularly for this purpose. This is a refreshing snack that can also be found in Cappadocia and can be made by shaving ice and dousing it in a grape or other fruit molasses. Bıcı bıcı is a version native to Adana, incorporating cubes of starch as a base, which are then doused with sweetened snow or shaved ice and a fruit syrup. The tapioca-like cubes are reminiscent of the soft and squishy boba pearl balls that one finds at the bottom of Thailand's famous ice tea.Due to their seasonal nature, some of the most popular mezes, which are mainly shared vegetarian dishes, are only available in the summer months and thus in high demand. Similar to the luscious cherries and apricots that are in abundance in the heart of summer, if you blink, suddenly these beloved fruits just disappear as the country's supply is primarily reliant on domestic harvests. When it comes to dishes based on seasonal produce, stuffed squash blossoms, in Turkish kabak çiçeği dolması, certainly fall in this category. The delicate petals of this edible yellow flower, which can only be gathered in the early morning hours and are also referred to as zucchini flowers, are stuffed with a rice mixture flavored with a variety of herbs, such as mint and parsley and even currants. 'Tis the season of yaprak sarma, the tightly-rolled, cigar-shaped stuffed grape vine leaves that are iconic in Turkish cuisine. The filling for these tasty treats consists of a classic mix of rice, currants and spice and is almost always vegetarian; however, there are also lesser-prevalent versions that incorporate meat. The painstaking rolling process and its outcome is a sign of pride and a custom that is still regularly taught to younger generations. Vegetables, especially wild greens, play central roles in summer cuisine, particularly in southern coastal holiday destinations. Aegean cuisine is famous for its vast array of vegetarian mezes and greens. Of these, deniz börülcesi, in English referred to as samphire, glasswort or sea grass, is a form of salt marsh weed that is painstakingly picked and prepared in the spring and summer months. The trying process of peeling the weed from its husk is another task passed down through generations; however, its outcome is well worth it both in taste as well as for its high nutritional properties. The classic way to serve this form of seaweed is to boil it and then douse it in olive oil with crushed garlic and to squeeze lemon over the top. Semizotu, purslane in English, is another green that is favored in the summer as it is most regularly prepared by simply mixing its raw form with yogurt. Perhaps the most special treat of Turkish cuisine in summer is the vast array of wild herbs and greens that are available especially in the Aegean region. Arapsaçı, in English fennel; ebegümeci, which is mallow; hardal otu, which is wild mustard; kuzu kulağı, which is sorrel; su teresi, the Turkish word for watercress; and turp out, referring to wild radish, are just some of the wonderful greens that restaurants will be presenting in their glass display cases this summer. They can be ordered on their own or in many cases, restaurants will prepare a dish in which the greens are sauteed together and then doused in yogurt and a pepper-oil sauce.